Many parents are eager to teach their child to read and write. If you are already familiar with the Montessori method, you may have purchased the Sandpaper letter and you would like to know how to teach the alphabet to your little one. The written letters are an abstract concept, the representation of the spoken sounds that make up words when blended together. Before starting to "teach" the visual representation of the sounds, aka the letters, your child must develop a phonetic awareness. 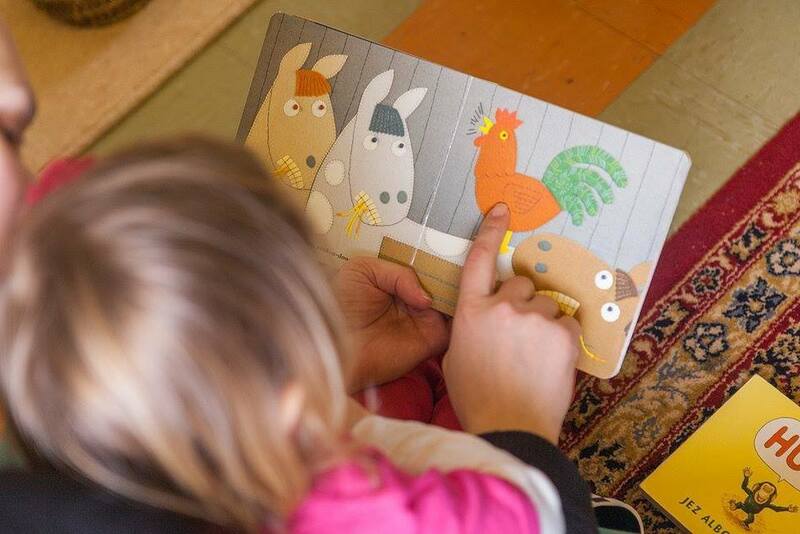 You will have already begun to read books to your child and books that have a rhyme and rhythm within them. Make sure you also read poetry and rhyme books. These will help your child to recognize sound rhythms, how sounds go together, how sounds make up words. In addition to this natural way of listening to sound and rhythms, you can play a variety of sound games to raise her phonetic awareness. Before starting the sound games, make sure you say the sounds correctly. It is a like apple, not "ai" like the abc song. Watch the video below to make sure you pronounce each sound properly. The sound game will help your child to be aware of the sounds that make up words. Play it as often as you can. This is the best preparation for writing and reading. In the book Montessori Read and Write, the author identifies 6 levels in this game. Read below and watch this video to see the game in action. Gather a few objects that your child knows the name and put them in front of you. Avoid objects that start with a similar sound such as "p" and "b". Take objects with contrasting sounds. Say while pointing or holding an object "I spy with my little eye something beginning with "s", you child will name the object, for example "snake". You play with one object at a time. Vary the objects and play this game often, as long as your child enjoys it. Gather 2 with a different initial sound. For example, 3 plastic animals such as "snake" and "lion" . Say "I spy with my little eye an animal beginning with "S". 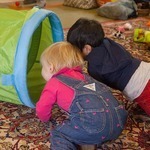 Play that game with 2 contrasting initial sounds often and as long as your child enjoys it. To make it more challenging, place 3 objects in front of your child and up to 5 objects with contrasting beginning sounds. Encourage your child to spot objects all around. This game can be played anywhere and it's perfect for the car journey. Say to your child "I spy in the car something beginning with m", he might answer "mummy" or "map" or "Mark - his brother" and motorcycle that is passing by the car (not technically in the car but the goal is to encourage your child to find objects starting with a designated sound). You can also use a picture from a magazine and ask your child to find objects beginning with a specific sound. 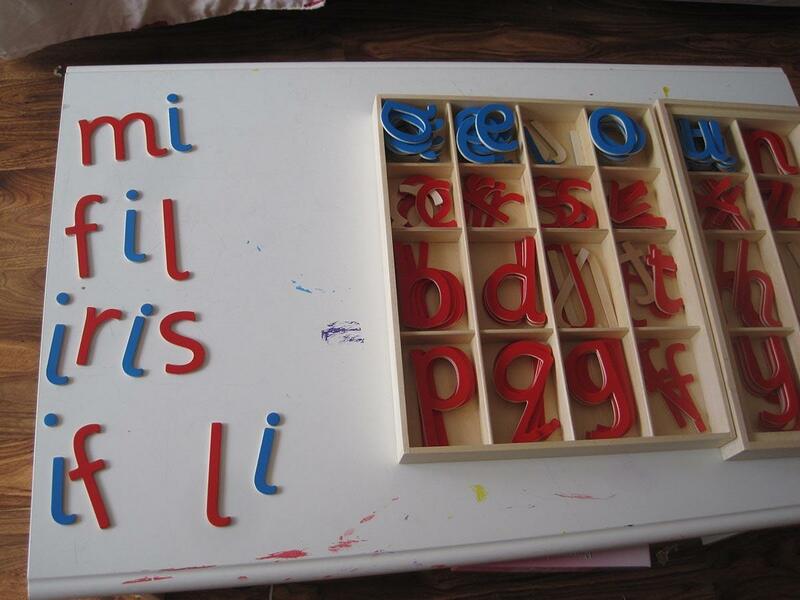 Once your child has mastered the first 3 levels, she might be ready to be introduced to the Sand Paper letters. With this game, you will focus on the end sound. I like to start this game with objects and when your child is familiar, you can do the level 3 game with ending sound. Gather 3 objects that start with the same initial sound such as "ball", "bag" and "bird". Say "I spy with my little eye an object that starts with b and ends with "G". If your child makes a mistake, you can reply "yes ball start with b but I asked for something that begins with b and ends with G" then sounds out ball, demonstrating each sound, asking your child what she hears when she says b - a - l - l. Do the same with the 2 other objects until she can identify the correct end sound. Once your child can identify beginning and ending sound, you can help your child to identify the other sound in the words. Start with some 3 letter words such as "cat", "mug", "ant" and so on. First, let your child identifies the initial and last sound, then tell her that you are going to find the other sounds in the word. Say "this is a cat, it starts with "C" and ends with "T", what else can we hear? Let's sound it out "C" "A" "T, what did you hear after "C"? Say the sound with her if she struggles. Sound out several 3 letter words and when your child can do the game easily, add more complex words. When she has mastered those 5 levels and she has been presented to the Sandpaper letters, she is ready to be introduced to the large Moveable alphabet. This game will help your child to use all the knowledge about sound gathered thus far. Think of a sound such as "m" and ask your child to tell you as many words as he can starting with "m", then to think about words ending with "m" and words with a "m" within them. You can also use pictures that you print or cutout from magazines. You can encourage your child to find objects that rhyme. We love the game "Slug in a jug"
And you can also find some free printable rhyming games. Once your child can match easily to rhyming pictures, line up 2 pictures that rhymes with one pictures that is the odd one out. Ask her to find the picture that doesn't rhyme. The book Montessori Read & write is the book you will need to explore more sounds games, and how to progress from those sounds game toward reading and writing activities. Do you want to learn more about Montessori as a parent? My next guided course is starting on the 11th of February. More info here.